The Crazy Bookworm: One Lovely Blog Award! I want to thank Books and Bliss for giving me this award! This is how the award works: 1. Accept the award, post it on your blog together with the name of the person who has granted the award and his or her blog link. 2. Pass the award to 15 other blogs that you've newly discovered. 3. Remember to contact the bloggers to let them know they have been chosen for this award. Many thanks for the award. As Lisa says its really encouraging when you are so new to blogging to be given an award. Hi! I gave you an award! 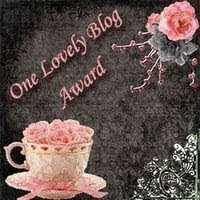 Thank you for the One Lovely Blog Award! It is such a treat! I am excited about passing it along to others that I have discovered recently and love reading. Happy Friday! Congratz on the award and thank you for sharing the love and passing it on :) I'm glad you like my blog! !